Is there anything Melbourne loves more than a new Malaysian restaurant? 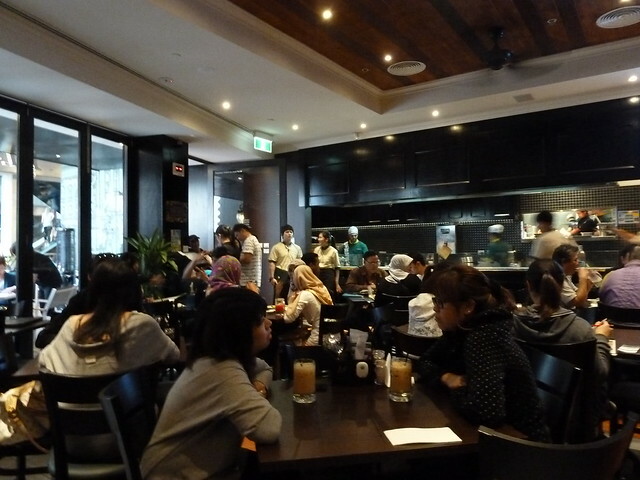 PappaRich is at the old site of Old Kopitiam Mamak at QV, and despite its somewhat secluded location, it's already jumping. This is a big chain in Malaysia. The ordering is really streamlined (see below) and there's a big open grill where you can spy your satays and roti coming to life. It's a big menu with loads of glossy pictures, which I love. 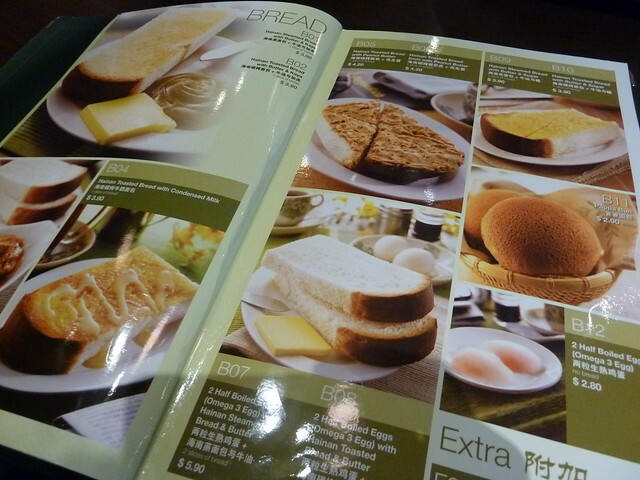 There's a big section of things with super-soft Asian-style bread, which is very interesting! 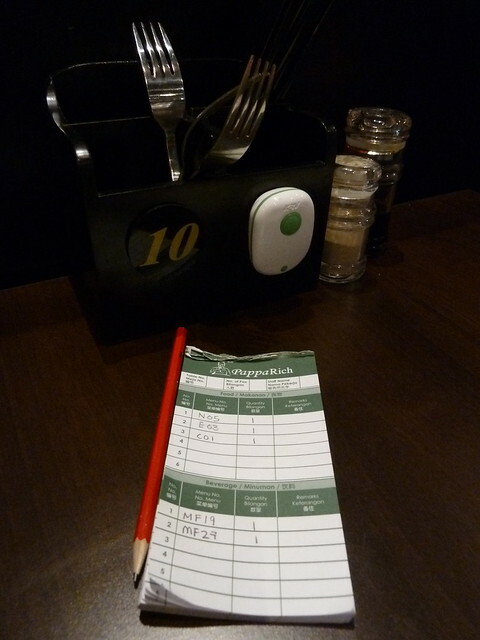 To order, write your numbers on this funny little pad that feels like something out of a board game and press the buzzer. A staff member whizzes past to grab the docket, before returning with your bill stapled to the order form. It sounds impersonal but all the staff were very friendly. Unfortunately this char kway teoh was a confoundingly huge BA-BOWWW fail. The thin noodles were wrong (someone correct me if I'm wrong about this), there was no wok hei and the sauce was incorrect, being too sweet - it tasted almost like pad Thai. The whole thing tended towards glugginess. Such an odd thing to stuff up! This roti plate was excellent though - the roti is made in house on a big flat plate and is super delicate inside with gorgeous crispy edges. Included in the price are tastes of wonderul yellow split dea dal, full of earthy popped mustard seeds; a little chicken curry-style gravy, full of warming cardamom and sweetly cooked onion without a hint of bitterness; and jammy, spicy sambal. Total bargain light lunch at only $5.50! The tea wasn't quite right - it wasn't tannic enough, as good teh should be. 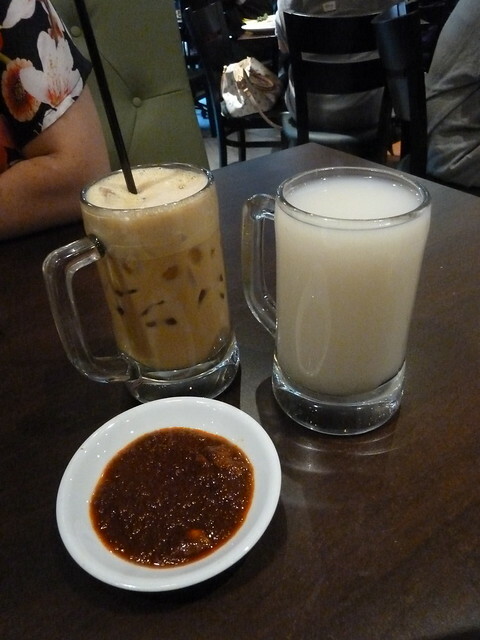 The barley drink was new for me and surprisingly good, warm, sweet and almost viscous. Apparently they do organic soy milk drinks too (they were out that day). Don't bother with this anchovy sambal if you already have sambal in your meal - the anchovies were almost nonexistent anyway. 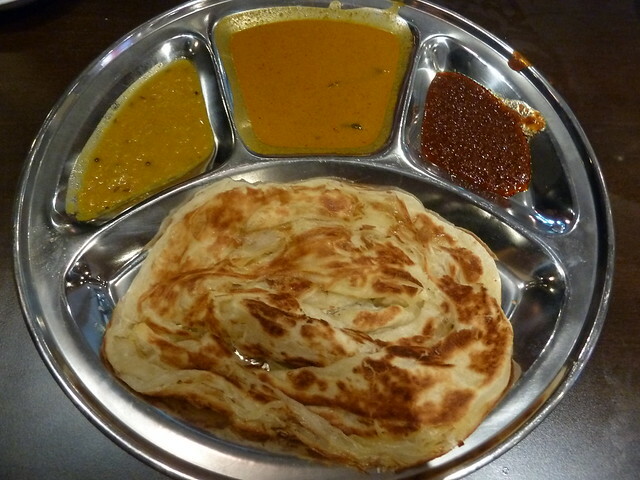 The roti win outweighed the CKT fail, and I'm keen to try more at PappaRich. They have a vegetarian section with mock meat dishes (including a few yum cha-style items) that definitely looks worth trying. Satays look good too. Check out Urbanspoon for a staggering amount of user reviews - it's certainly captured Melbourne's attention. NOTE! Gurney Drive in West Melbourne was previously highly recommended on these fair pages. It's now turned into Kari Leaf and from two separate reports from trusted sources, it's very disappointing. Proceed at your own risk! Two great bloggers I know, Bryan (@fatbooo) and Winston (@winceeee), are stepping up and doing "Live Below the Line", a challenge in which they live on a meagre $2 worth of food per day for 5 days, to raise awareness of extreme poverty and raise funds for the Oaktree Foundation. Have a read about it on their blogs and perhaps even consider sponsoring them. Bryan's even going to take it up a notch, giving up an extra western-world luxury like hot water or electronic gadgets for each day of the challenge - culminating in no food at all on the final day. I'm really looking forward to reading how their experiences went. 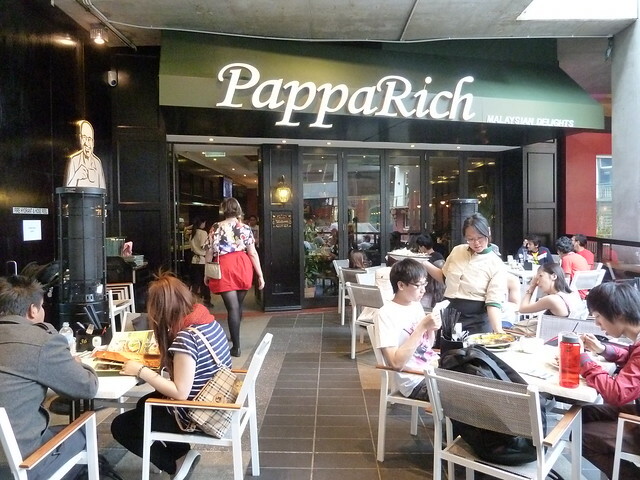 I had Papparich the last time I went back to Malaysia. Argh. Yuck. I did not enjoy my meal at all. I hope the Melb version is better. Though by all accounts, it doesn't sound like it's muchhhhh better. I live in KL and Pappa Rich is everywhere but after trying it once, never again. To think it's now in Melbourne, laughable! Oh Lauren, I did not like Pappa Rich one bit! I went to the one out Doncaster way (I was at Doncaster shoppingtown ... AMAAAZING!!. We had a plate of Crispy chicken skin ... which was yummy enough but served with sweet chilli sauce (sweet chilli sauce should be banned by the way). My Kway Teow noodles came with a plate of succulent hainanese chicken but the underlying sauce was soooo sweet! And yes they used Pad thai noodles ... instead of Kway Teow ... thats just the height of rudeness. Oh dear!!! Maybe I got the one decent dish as it sounds like everyone is unanimous that it is bad! Honestly, the roti and sauces were really really yummo. I will proceed with caution on subsequent visits! 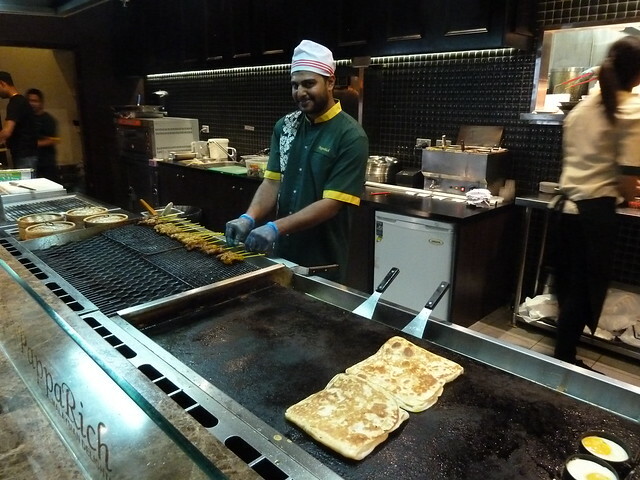 I had a the takeaway dessert roti with sugar and condensed from there last week and loved it! Not quite as good as the Thai version with bananas but the best sweet roti that I've found in the CBD. Good to hear Andy! The satays did look really good too. Maybe the grill section rocks while the wok kitchen isn't up to scratch? Ooh, thanks for posting this. Always love reading about other places I could try with my little kids. That Roti looks like a good choice when we visit! Hi, Just curious....if this is Footscray Food Blog why are we getting posts about restaurants in the city? I thought the idea was to hear about local establishments, otherwise it's just another food review site. Gee anon... I don't really know how to take that. This blog is a totally volunteer exercise, with no rules other than what I put on it. 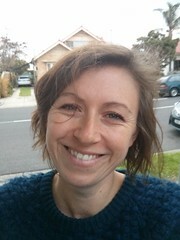 In my very first post I wrote: "Solution, a blog about eating locally and cheaply in Footscray. Forays into the city and further west likely, perhaps even some fine dining if we get lucky!" I don't know what else to say except that I love the city, I think there is so much rich and wonderful food culture there and I enjoy writing about it. I don't just write about Footscray - I write about the whole western slice, which I consider starts in the city and fans out to St Albans, Williamstown and far beyond. You've got to remember this blog traces my life and what I do. The more restrictive I get - as in, friends say, "let's try this awesome new whatever place in town" and I feel like I have to say, "Sorry, I'm really low on posts, please can you all come to Footscray *just* so I can blog about it?" - the more restrictive I get, the less posts you get and the less I enjoy blogging = less likely I am to continue this often time-consuming and not exactly cheap hobby. If you don't want to read about places in the city, please just don't read the posts. Otherwise I guess I am "just another food review site". 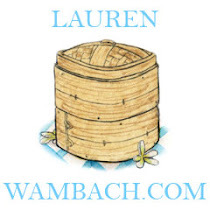 Hi, Sorry Lauren, no offence intended, I was just thinking that the city gets more than its fair share of reviews while the west often gets overlooked, which is why I like your blog, as I get to hear about local places to try out and look forward to hearing about them. Sorry to be crabby. Don't worry, I'm not doing any big shift away from Footscray or the west. I've been doing bits and bobs about the city for a while now, but I suppose they have increased as time has gone on, simply because as my kids get older, I'm finally getting a chance to get out more. I have questioned whether I should write about places in town - I went to Senoritas recently, took all the photos but in the end decided not to write about it as I don't think my audience wants to hear about $12 tacos!! I do know that some do enjoy the city posts though, Malaysian places in particular. I would like to add that I love your blog and often look here for advice and where to try next. The fact that you do write about the city makes it even more fun and interesting for your readers as we too will venture out of the west to try these places. I also love the city but with a little one now I dont get to eat out there as often as I used to, it is nice to know we can look to a trusted blogger with good taste to give us some tips. Keep em coming. I love your blog and do not care where you review and for someone to say you should not write about certain area's is the height of rudeness. Your blog, your way. Infact I like your reviews about the city because that is easiest to get too. Keep doing what you doing, your blog is brilliant. Thanks Donita and anon for your support... I don't think the first anon really meant to cause any offence. I was talking about this to another close blogger friend and he said (and I agree) that while the name "Footscray Food Blog" is great for instant "aha!' recognition or whatnot, it does create confusion when you look and think "what are CBD and North Melb places doing here?" Maybe I need to change my bio in the sidebar so newer readers know what to expect. I will correct you then. You were previously eating bastardised CKT. 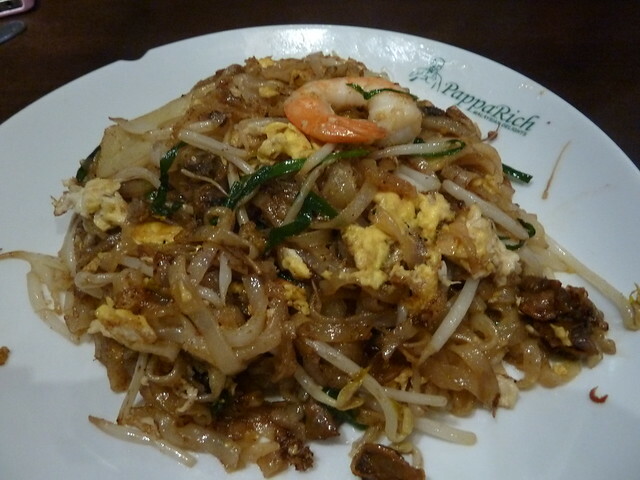 What you are eating at Pappa Rich is a version from Penang. I'm from Penang and you will find the CKT is of a thinner noodles variety. Quite close to pad thai noodles. The fat flat noodles thats drenched so it looks like 'black' CTK, thats a bad version of CTK, I call it cantonese version. Run when you see it.